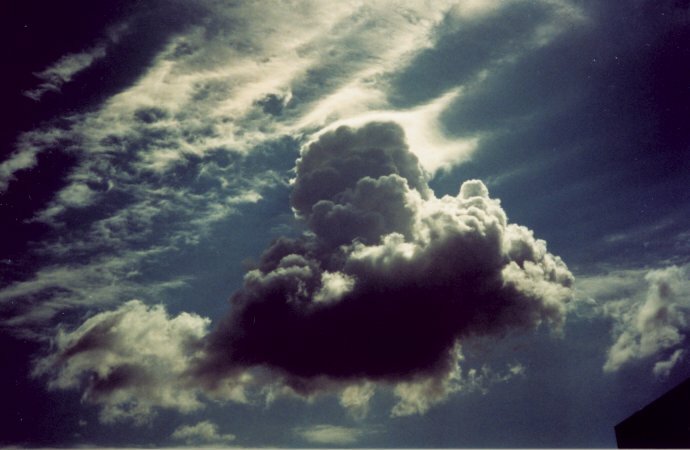 Photo of the Week.. A giant cloud floats on an invisible ocean of dense air. Astronomy news for the week starting Friday, January 10, 2003. We begin the week with the first quarter Moon, which takes place on Friday the 10th. The rest of the week sees the Moon waxing to full, this phase passed the following Saturday, the 18th. Less than a day after first quarter our companion passes apogee, where it is farthest from the Earth (at a typical distance of 405,500 kilometers, or 252,000 miles, six percent greater than average). Though angularly smaller than usual, with no ready reference the effect is not visible to the eye. The night of Wednesday the 15th, the Moon will present itself just to the east of Saturn, which is passing just above Zeta Tauri, the star that makes Taurus's southern horn. The ringed planet, a spectacular sight in a telescope, now crosses the meridian to the south around 10 PM. Much brighter Jupiter is now also making a major impact on the evening sky. Well to the east of Saturn, it rises shortly before 7 PM, making a fine sight as it lofts itself above the eastern horizon. The focus this week, however, is really on the two inner planets. Mercury invisibly passes inferior conjunction with the Sun (between us and the Sun) on Saturday, the 11th. In stark contrast, Venus passes its point of GREATEST visibility, reaching greatest western elongation relative to the Sun the day before, on Friday the 10th. At that time it will be a full 47 degrees to the west of the Sun. Rising just before 4 AM, the planet shines with amazing brightness in the pre-dawn sky. At elongation we look at half the daytime side of the planet and half the nighttime side. As a result, Venus then looks like a quarter Moon as seen through the telescope. (That Venus goes through a full cycle of phases provided Galileo with proof that the Earth really does go about the Sun.) The same day that the Moon passes Saturn, on Wednesday the 15th, Venus passes 8 degrees north of the bright star Antares in Scorpius, Antares' reddish color contrasting nicely with Venus's creamy white. The morning of Wednesday the 15th the planet will be north and a bit west of the star, the following morning north and a bit east. Just up and to the right of Rigel, the lower right star in Orion's spectacular figure, lies Cursa, "Orion's Footstool," the star that begins the great meandering celestial river, Eridanus. The River winds far to the west of the great Hunter and then (for most of the US and all of Canada) plunges down across the southern horizon, ending finally in first magnitude Achernar, which is readily visible only from south of 30 degrees north latitude. A line drawn from Cursa through Rigel points southerly to Lepus, the Hare, Orion's small prey.